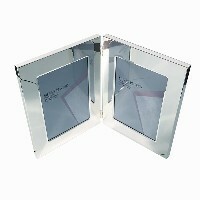 A collection of both Silver Plated and Sterling Silver Photo Frames of various sizes. Classic Silver Plated Picture Frame. Velvet Backed, which can be used as Portrait or Landscape. Lacquered tarnish resistant. Please Note: The quoted measurements are in 'inches' and relate to the size of picture / photo that the frame is designed to accommodate. Picture Size: 6" x 8"
Classic double folding picture frame. With the folding design this means you can transport the frame easily and not worry about smashing the glass. 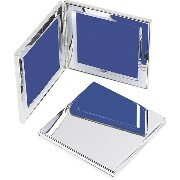 Silver Plated, three picture frames for the price of one - great looks and perfect proportions. Foldable / Travel mini double picture frame to store two photographic memories in the same place. 'Silhouette' 3.5" x 5" Elegant Silver Plated picture frame in lacquered silver plate. One size only. Frame Size: 3.5" x 5"
Picture Size: 3.5" x 5"